Drew Barrymore will direct and produce a film adaptation of Ally Carter's young-adult thriller Heist Society for Warner Bros. Shauna Cross will write the screenplay. In the book, when Katarina Bishop was three, her parents took her to the Louvre ... to case it. For her seventh birthday, Katarina and her Uncle Eddie traveled to Austria ... to steal the crown jewels. 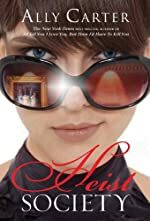 When Kat turned fifteen, she planned a con of her own — scamming her way into the best boarding school in the country, determined to leave the family business behind. Unfortunately, leaving "the life" for a normal life proves harder than she'd expected. For Kat there is only one solution: track down the paintings and steal them back. So what if it's a spectacularly impossible job? She's got two weeks, a teenage crew, and hopefully just enough talent to pull off the biggest heist in her family's (very crooked) history — and, with any luck, steal her life back along the way. The studio is expected to age the characters from their teens into their early 20s. The second book in the series, Uncommon Criminals, was published earlier this month by Hyperion. Bantam Books, an imprint of Random House, announced yesterday that it will publish a graphic novel (comic series) adaptation of George R. R. Martin's fantasy thriller A Game of Thrones. The series will be adapted and scripted by Daniel Abraham and illustrated by Tommy Patterson. The first issue of the monthly comic — which will be published by Dynamite Entertainment — is planned publication in September 2011, with compilations of the comics in graphic novel form to follow under the Bantam imprint. "It's a real privilege and a treat to be involved with reinterpreting A Game of Thrones," says writer Daniel Abraham. "It's a brilliant piece of work, and watching the strength of that story come into a visual medium is fantastic." The novel also served as the basis for HBO's Game of Thrones that just concluded its first season and has been renewed for a second — which is likely to be based on the second book in the "A Song of Ice and Fire" series, A Clash of Kings. About the series: Long ago, in a time long forgotten, a mysterious event threw the seasons of the world out of balance. Now the kingdom is blessed by golden summers that go on for years, and cursed by cruel winters that can last a generation. In the cool north of this kingdom is a royal family ruled by Eddard Stark. The symbol of the royal house of the Starks is a direwolf; their motto is "Winter is coming." As indeed, it is. For the Iron Throne of Westeros is once more under contention. With Eddard's help, Robert Baratheon won it away from the corrupt Targaryens, who had ruled Westeros for generations. But when Eddard is summoned south to help an aging king hold the throne they both won, he finds himself enmeshed in a web of treachery and lies, as faction after faction plays that most dangerous game of all: the game of thrones. Death Toll by Jim Kelly. A Peter Shaw Mystery. Minotaur Books Hardcover, June 2011. The cold case investigations in this multi-layered mystery are nicely plotted, intricately devised without being overly complicated. This is a fine example of the books in this series, one that should have a long run ahead of it. 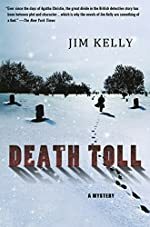 Read the full text of our review at Mysterious Reviews: Death Toll by Jim Kelly. Read the first chapter(s) of Death Toll below. Use the Aa settings button to adjust text size, line spacing, and word density. 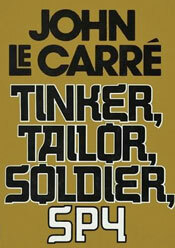 An international trailer for the film adaptation of John le Carré's 1974 thriller Tinker, Tailor, Soldier, Spy has been released; we've embedded it below. Set in the 1970s, recently retired MI6 agent George Smiley (Gary Oldman) is doing his best to adjust to a life outside the secret service. However, when a disgraced agent reappears with information concerning a mole at the heart of the Circus, Smiley is drawn back into the murky field of espionage. Tasked with investigating which of his trusted former colleagues has chosen to betray him and their country, Smiley narrows his search to four suspects—all experienced, urbane, successful agents—but past histories, rivalries and friendships make it far from easy to pinpoint the man who is eating away at the heart of the British establishment. The film also stars Colin Firth (Bill Haydon, "Tailor"), Mark Strong (Jim Prideaux), Benedict Cumberbatch (Peter Guillam), Ciarán Hinds (Roy Bland, "Soldier"), Toby Jones (Percy Alleline, "Tinker"), and Kathy Burke (Connie Sachs). It will open in US theaters November 18th, 2011. 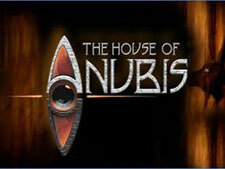 Nickelodeon has renewed its teen mystery series The House of Anubis for a second season. The first season aired earlier this year with 60 "episodes", 11-minute segments that aired two per half hour of show time. Production on the second season is expected to begin this summer in Liverpool (England). Watch a trailer for the first season below. The nominees for the 2011 Macavity Awards have been announced by Mystery Readers International. The winners will be announced at Bouchercon, the World Mystery Convention, which will be held this September in St. Louis. indicates a review is available from Mysterious Reviews. A new trailer for the fourth Mission: Impossible film has been released by the studio, which we've embedded below. Titled Mission: Impossible, Ghost Protocol, the film stars Tom Cruise, Simon Pegg, Ving Rhames, Jeremy Renner, and Paula Patton, who are implicated when the IMF is shut down in a global terrorist bombing plot. Ghost Protocol is initiated and Ethan Hunt and his rogue new team must go undercover to clear their organization's name. No help, no contact, off the grid. There has never been a mission grittier and more intense than this. The film opens in US theaters on December 16th, 2011. MystereBooks is pleased to feature a mystery title that is currently available as a Nook Book for free from Barnes&Noble. We don't know how long it will be offered at this special price (typically only until a certain number of downloads have been completed), so download it today! 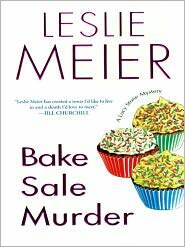 About Bake Sale Murder (from the publisher): Ever since local developer Fred Stanton and his wife, Mimi, built five modular homes next door to Lucy Stone's farmhouse, life just hasn't been the same. With Mimi complaining about everything from the state of Lucy's lawn to another neighbor's lovable dog, quaint Tinker's Cove, Maine, is now entangled in cul-de-sac politics and backstabbing. And when Mimi doesn't show up for her shift at The Hat and Mitten Fund bake sale, the scent of burnt sugar leads Lucy to a shocking discovery — Mimi, face down on her kitchen floor-with a knife in her back. While the police start their investigation, Lucy gets busy writing up the murder for the local Pennysaver — and following a few leads of her own. Lucy knows the women in her neighborhood didn't like Mimi, but they certainly didn't want her dead ... right? The Two Deaths of Daniel Hayes by Marcus Sakey. Non-series. Dutton Hardcover, June 2011. This creatively imagined and solidly written novel of suspense is marred only slightly by several contrived story elements and a sense that, in an effort to continually surprise the reader, the plot needs to be more clever than it already is. 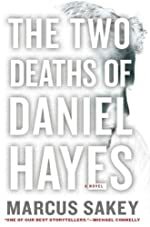 Read the full text of our review at Mysterious Reviews: The Two Deaths of Daniel Hayes by Marcus Sakey. Read the first chapter(s) of The Two Deaths of Daniel Hayes below. Use the Aa settings button to adjust text size, line spacing, and word density. This suspense drama is a multi-layered, heavily nuanced film with exceptional performances by Meryl Streep and Phillip Seymour Hoffman as adversaries in an early 1960s New York City Catholic school. 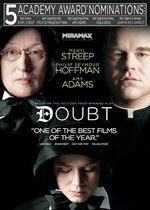 Read the full text of our review at Mr. E. Reviews Doubt. 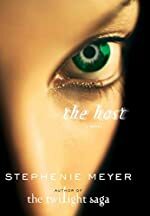 Open Road Films has acquired the distribution rights to the film adaptation of Stephenie Meyer's 2008 bestselling sci-fi thriller The Host. Production is expected to begin in February 2012, with Andrew Niccol (Gattaca, Lord of War) directing his own screenplay adaptation. Saoirse Ronan (Hanna, The Lovely Bones) has been signed to star as Melanie Stryder, a young woman who refuses to allow an alien species that has invaded the earth to take over her soul. Wanderer, who has been given Melanie's body, knew about the challenges of living inside a human: the overwhelming emotions, the too vivid memories. But there was one difficulty Wanderer didn't expect: the former tenant of her body refusing to relinquish possession of her mind. Melanie fills Wanderer's thoughts with visions of the man Melanie loves—Jared, a human who still lives in hiding. Unable to separate herself from her body's desires, Wanderer yearns for a man she's never met. As outside forces make Wanderer and Melanie unwilling allies, they set off to search for the man they both love. 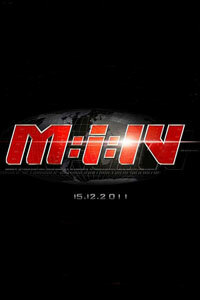 The film has a tentative release date of March 2013. You can read the first chapter(s) of The Host below. Use the Aa settings button to adjust text size, line spacing, and word density. MystereBooks is pleased to feature a mystery title that is currently available as an eBook for free from Kobo. We don't know how long it will be offered at this special price (typically only until a certain number of downloads have been completed), so download it today! About Executive Privilege (from the publisher): When private detective Dana Cutler is hired to follow college student Charlotte Walsh, she never imagines the trail will lead to the White House. But the morning after Walsh's clandestine meeting with Christopher Farrington, President of the United States, the pretty young coed is dead—the latest victim, apparently, of a fiend dubbed "the D.C. Ripper." A junior associate in an Oregon law firm, Brad Miller is stunned by the death row revelations of convicted serial killer Clarence Little. Though Little accepts responsibility for a string of gruesome murders, he swears he was framed for one of them: the death of a teenaged babysitter who worked for then-governor Farrington. Suddenly nowhere in America is safe for a small-time private eye and a fledgling lawyer who possess terrifying evidence that suggests the unthinkable: that someone at the very highest level of government, perhaps the president himself, is a cold and brutal killer. We're always on the lookout for new mystery, suspense and thriller books, and with this series of recurring posts, we're looking at Indie Mysteries, books published by small, independent publishers, or self-published, that recently caught our eye ... and may be of interest to you too. Most of these titles, selected primarily from the Smashwords website, are ebook only, though some may be available in a print format. After listing one of Connecticut's most prestigious Victorian homes, Victoria finds herself experiencing unnatural happenings. Believing these events are merely her imagination, she ignores any signs of evil. The home, now abandoned and with its own history of violence, attempts to warn her that her newly acquired buyer, Peter, may have a history of repeated methodical killings. As different dimensions of reality coexist simultaneously, Victoria faces danger intertwined in a web of violence that could result in life or death. Lust and true desires are hidden behind a facade of normalcy. As Victoria and Peter struggle to fulfill their personal vision, their paths intertwine during a promotional masquerade ball at the home. As the storm of the century approaches, party guests cast aside all inhibitions while disguised behind the protection of their masks. The line between what is real and what is an illusion becomes blurred. The ultimate struggle of life and death ensues as each fights to fulfill their desires and ultimately reveal their true character. The citizens of San Antonio, Texas are threatened with extermination by a terrifying outbreak of the flu. Quarantined by the military to contain the virus, the city is in a desperate struggle to survive. Inside the quarantine walls, Detective Lily Harris is working burial statistics duty at the Scar, San Antonio's mass graveyard, when she finds a murder victim hidden amongst the plague dead. But Lily's investigation into the young woman's death soon takes a frightening turn as yet another strain of the deadly flu virus surfaces, and now Lily finds herself caught up in a conspiracy orchestrated by a corrupt local government intent on hiding the news from the world and fighting a population threatening to boil over into revolt. As the city erupts in violence, Lily is forced to do the unthinkable. With the clock ticking toward annihilation, Lily must lead her family through the quarantine walls and escape with news that just might save us all. Quarantined was previously published as a paperback by Lachesis Publishing in March, 2009. FBI Special Agent Jack Miller, pulled into a high-profile case to mentor a new agent, finds himself in a clash with the toughest opponent of his career. The chase culminates in the bowels of the city, in the storm sewers and tunnels beneath The Ninth District Federal Reserve of Minneapolis. After 12 years on the Halifax police force, homicide detective Allan Stanton has reached his limit. The days of thinking of himself as a crusader for justice are long gone, replaced by a weary sense that he’s just there to clean up the detritus left in the wake of the human predators that stalk the city streets. The job has taken everything from him—his innocence, his joy, even his family—and he finally makes the decision to leave it all behind and start anew. Before he can do so, he’s assigned another case. This time the killer isn’t content just to slay his victims, but takes parts of their bodies with him when he goes. A pair of eyes. A set of hands. Even a heart. The murders have all the hallmarks of a serial killer who’s collecting trophies. But as Allan unravels the grisly mystery, he realizes that nothing could be further from the truth. He discovers that the killer might just be closer than he ever expected and has targeted him as the next victim. For more recently published Indie Mysteries, visit the Smashwords Mystery and Detective category page or the Thriller and Suspense category page. First Clues: Mysteries for Kids is pleased to announce a selection of new mystery, suspense and thriller books (including series books) scheduled for publication during July 2011, listed in approximate order of reading level, from books for younger readers to books for teens. The friends volunteer to help the water fairies tend to their underwater gardens. While they work, a fairy tells the sad tale of the beautiful mermaid Aroona and her human love, Sir Topaz. All the mermaids believe the tale — except for Jasmine, who thinks its just a silly story. But when Jasmine discovers the trail that leads to Aroona's lost treasure, she sets off to discover the truth. The Mermaid Mysteries are recommended for readers aged 4 to 6. The Milo and Jazz mysteries are recommended for readers aged 7 to 9. My day got even worse when my best friend Leo's homework went missing. Leo blamed Scout! I know Scout's a dog, but trust me — he did not eat Leo's homework. But how would I prove it? There was only one thing to do — I had to talk to the animals around town. It was up to me, Jack Doyle, to get a clue and solve the mystery. Jack Gets a Clue books are recommended for readers aged 7 to 9. Yeah! My third grade class was going on a field trip to a farm, and I couldn’t wait for a day off from regular school. But I wasn’t expecting to hear a voice coming from my backpack during the bus ride to the farm. It turns out my annoying little sister had hidden her pet tortoise, Tut, inside, and the voice was his! It’s true — I can talk to animals, and they can talk to me. As if babysitting a tortoise wasn’t bad enough, things got worse when Tut disappeared. My mystery-solving partner, Elizabeth, and I had to interview all the cows, horses, goats, and flies on the farm as we looked for clues. It was up to us to find Tut before the end of the day, and we were on the case! It's spring break and Kate and Mike are off to Los Angeles to visit Kate's dad, a scout for the Dodgers. But all is not sunny in L.A. — strange things have been happening to Kate's dad. Pages have gone missing from his clipboard. He's gotten threatening phone calls. And he thinks he's being followed! Is someone after Mr. Hopkins's top secret scouting reports? The L.A. Dodger includes a fun fact page about Los Angeles's Dodger Stadium. The Ballpark Mystery series books are recommended for readers aged 7 to 9. Eleven-year-old Neela dreams of being a famous musician, performing for admiring crowds on her traditional Indian stringed instrument. Her particular instrument used to be her grandmother’s — made of warm, rich wood, and intricately carved with a mysterious-looking dragon. Despite possessing the rare gift of natural magic, Oona wants to be a detective. Eager for a case to prove herself, she wants to show her uncle — the Wizard of Dark Street — that logic is as powerful as magic. But when someone attacks the Wizard, Oona must delve even deeper into the world of magic to discover who wanted her uncle dead. Sometimes Rico acts a bit odd — his mom calls him a "proddity" — but he's genius at noticing little things nobody else does. Like a string of spaghetti stuck to the sidewalk. Or the big buckteeth of that boy in the blue motorcycle helmet. Or the strange behavior of the neighbors in his apartment building. Oscar is a true prodigy, with a high IQ and high anxieties to match. He's the one who wears the blue helmet — to protect his precious brain! Oscar may have a lot of book smarts, but he needs Rico's help to face his biggest fears. And when other kids mysteriously start going missing, it's up to the two friends to use their noodles, keep track of the clues, and crack the case! This mystery is recommended for readers aged 10 to 12. Can Jo Bell spin a web big enough to catch ... a criminal? They're sweet and friendly ... but they just happen to be super toxic. The Deadlies are the world's most misunderstood family of spiders. Kicked out of home after home, all the Deadlies want is to settle down in a cozy web with no exterminators around. Now they've found the perfect place — the Rare Books room at the Boston Library. The librarian isn't afraid of the Deadlies, and they have lots of lovely books to explore. But their peace is threatened when a thief starts targetting the library. Can the Deadlies spin a web big enough to catch a crook — or is it back on the road once more? The books in the Deadlies series are recommended for readers aged 10 to 12. Eddie's family has been trapping lobsters for generations. but lately someone has been stealing their catch. When Eddie happens across the thieves' trap, he knows it's up to him to bring in the culprits. With the unlikely help of a boy who has run away from sailing camp, Eddie embarks on an adventure that puts his very life at risk. 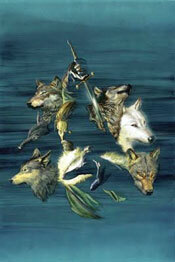 This tale of adventure is recommended for readers aged 13 and older.